Food Blogging Traffic & Income Report for February 2018. Watch over my shoulder as I show you how to increase traffic and improve your income on your food blog. If you’re new to RecipeThis.com, you may be wondering why I publish my income reports each month. Well one of the main reasons is that I am obsessed with numbers. I always have been since I was little and was helping my dad cash up in his record shop. Each month it gives me the chance (publicly) to show my figures and look at how the site is improving and ways that I can improve it next. I can look and see if a particular social media channel is performing better, if my traffic is better than the month before and so forth. It also gives me a chance to celebrate my victories with you too. In fact we have had more than 5.1 million but who is counting??? This is just for 2 years and 3 months of food blogging so it will be interesting to see where we are in double that time from now. We all talk about a 5 year plan when it comes to food blogs before we see really good results and to be honest, I am really happy with it now. It brings us in enough money to live on, eat out once a week (if we want to) and not have to worry too much about paying the bills. Of course it would be nice for more. That way we could get our house renovated (think Tom Hanks in the Money Pit) and be able to have a nice holiday. So watch this space and follow our dream as we do the job of our dreams. To start a food blog, you don’t need to have a studio or a huge kitchen to make it work for you. I often say that we live in a money pit. The house we bought 3 years ago has so many issues we will probably need to spend $100,000 to turn it into our dream home. It needs an extension, new roof, has no heating, has no air conditioning, damp issues, crumbling walls, a bad kitchen layout and a driveway that currently has huge holes in it. We found out recently that we have a septic tank. Something that we didn’t know about and that ours was now overflowing. The only problem is we have been digging on the driveway and have been yet to locate it. It seems the previous owners cemented over it and its location is a mystery. To get it fixed (once we find it) is going to cost thousands and that stops us from spending money on getting our kitchen done, or any other part of the house. The lovely elderly next-door neighbour points out that it took her 10 years to fix up her house and not to worry. So, I am trying not to freak out. But my point is that you just need a little corner from a room to take pictures with. Nothing spectacular just something that can still show off the food. We use a outside barbecue trolley that we picked up from IKEA. It’s on wheels so we can bring through our kitchen gadgets for recipe testing days. We wheel it into our dining area as we have better light there than our kitchen and then we have our dining table for prep and the BBQ unit for picture taking. Or get some pretty titles from a kitchen showroom and use those. I always call February the worst month of the year. Every food blog has its quiet time and I call February the dead duck. My blog is always at its best during December and January and sees the best numbers of the previous 10 months, then it tanks in February and has a steady rise, up until a huge jump again at Christmas. I also expect February to be the level that the rest of the year will beat. So, if we get 500,000-page views in February then I can expect a jump up to 600,000 and then back up to our Christmas 800,000-page views by the end of the summer. Or hopefully sooner. Its quite a difference when you add all this up after the event, though it’s a nice bonus! What we love the most about Monumetric, is the fact that a) we are not in contract with them and can leave if we wanted to without notice and b) that we are not exclusive therefore if we wanted to book a banner placement we could. Plus, we can also keep a small Adsense unit (its our further reading section at the end of the post) and our Amazon CPM. Well I was hoping for 500,000-page views for this month as a bench mark for the rest of 2018 and we are really pleased to achieve just short of 570,000-page views! We now will expect NOT to drop below this level for the rest of the year (well hopefully)! As usual there is not much of a change with our top 10 traffic sources. Google Search and Pinterest rule and this takes up just over half of all visitors to our site. We have also had a big traffic boom from MSN. I have never really noticed them before or taken them seriously for traffic but over a 2-day period they gave us a huge traffic blast and made it into our top 10 traffic sources. I am obsessed with my SEO traffic and out of all my traffic give it the most attention. It resulted in a third of all traffic to RecipeThis.com in February. Our SEO traffic has died but this was to be expected. Keywords that we rank for had huge traffic volume during December and January. People had their brand new Instant Pot and Air Fryers and needed easy recipes. Now they are still looking but not as much. Some of our positions have improved which is nice to see. One thing with SEO I wanted to discuss is the rinse and repeat method. It’s easy and it’s a great way to improve your rankings. Find a keyword that is doing really well in Google (maybe one of your top 5 results). Then pick a similar recipe that you can do a new recipe with. Google already has this association with you for the original keyword so do some more. The new keyword you are targeting must not be the same just same micro niche topic. That way you are not re-doing what you did before and it is still fantastic original content. Do this several times until you have a good selection of new recipes. 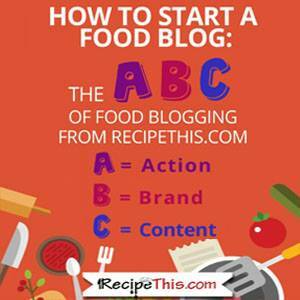 Then do a round up focused on your keyword and include in it, all your new recipes, your old one and other bloggers recipes. Rinse and repeat and do this with more of your keywords that you’re doing well for. You rank for baked chicken in a lemon sauce. Now do some more. One could be in a mushroom sauce, garlic sauce, honey and ginger sauce, buffalo sauce or even made into a lasagne. Each of them is new recipes in their own right but they share the “baked chicken” keyword. Then your round up is “10-minute prep baked chicken recipes”. All of them are different and they may even have different vegetables, potatoes cooked in a different way, but are still baked chicken. Now your SEO traffic for baked chicken goes from 5,000-page views per month to 50,000. Google now associates you as the master in baked chicken. You could also do this for any niche that you liked. We have nothing new planned. We are just enjoying food blogging, looking after our kids and lots of food. Some days we recipe test 5 recipes in the same day and feel like food is a mix of weird foods that don’t go well together. We even had a meal of 6 different vegetable meals a few days ago because we were working on Aprils content calendar! But we love it and couldn’t imagine doing anything else.